Miss Peregrine’s Home for Peculiar Children combines photography and fiction in a manner that works extremely well with the story. Our young hero, Jacob, has recently suffered a family tragedy and while trying to make sense of what has happened he discovers the mystery surrounding his Grandfather. 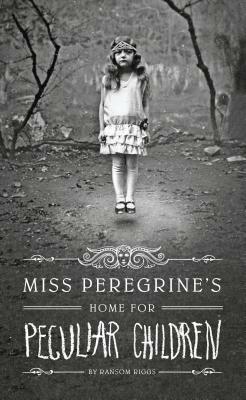 Just who or what is Miss Peregrine? What is the relationship she shared with his grandfather? Why were the children living at Miss Peregrine’s home segregated from the rest of the island’s inhabitants - are the children dangerous in some way? Jacob loved listening to his grandfather’s stories of growing up in an orphanage during World War II; tales of the headmistress Ms. Peregrine and her misfit, odd, peculiar children. He also loved looking at the collection of creepy, wonderful pictures of his grandfather’s friends with magical abilities and unimaginable skills. As Jacob got older, he started to believe that maybe his grandfather was just making these stories up to amuse him. They couldn’t possibly be true. Or could they? The day his grandfather is murdered changes Jacob’s life forever. Not only is he heartbroken, but no one believes him about the monster he saw kill his grandfather. Thrown into therapy, Jacob feels like the only way to get closure is to visit the orphanage in Wales. So begins Jacobs’ adventure in this book that is part mystery, part fantasy, with a thriller component. This book incorporates photography, storytelling, and early circus culture. All the photos used are real and become part of this fantastical story. The story is wonderful, but what makes the book is the pictures and how odd and creepy they are. They make you wonder about these people in the photos and bring their story to life. A truly wonderful read.